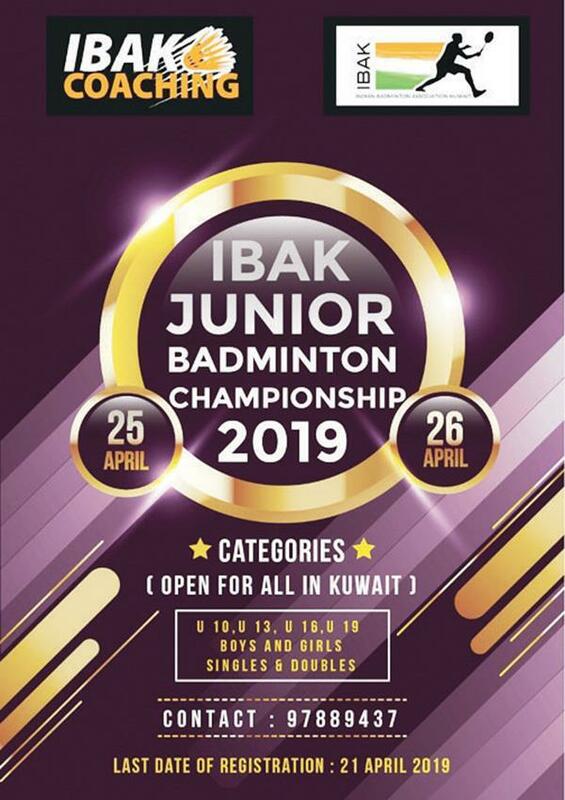 KUWAIT CITY, April 15: The Indian Badminton Association Kuwait (IBAK) opens new horizons for young talents through Junior Badminton Championship 2019, according to a press release issued by IBAK. IBAK coaching has designed a series of badminton tourneys in Kuwait for schoolchildren to help them participate and develop a sports culture. After winning many successes and accolades in recent times, currently the association is organizing the much awaited national open tournament for young broods 'IBAK Junior Badminton Championship 2019'. It's a sports league where every child gets to learn about their game by playing against the best players in the country. It's a platform for our future stars to showcase their ultimate skills. More than 200 participants have registered for the tournament displaying huge excitement and response among the young badminton playing community. The IBAK tournament will witness nail-biting matches where young and talented 'shuttlers' will fight it out for the top positions. Registration closes April 21, 2019 (12 midnight).